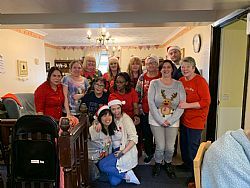 On 17th December, The Old Vicarage Care Home in Northants kicked off Christmas with the annual resident’s party. Our nursing home residents invited friends and family members to join us for a truly enjoyable Christmas party. To get everyone in the Christmas spirit, we were joined at The Old Vic Care Home in Kettering by a local vocalist Katie Rose. Katie is a fantastic singer and took us through the years with her performance, you can watch the video of everyone joining Katie for a sing along on our Facebook page. We all had the most amazing time together with some excellent food and entertainment. The room was decorated with personalised placemats, Christmas chair sashes, floral displays, candles and festive fairy lights. We served our guests a traditional roast followed by a choice of puddings which included our chef's very own Oreo gateaux along with fruit punch! Visit our Facebook page to view the wonderful selection of puddings the kitchen team made for us. A brilliantly festive day at The Old Vic!